LEXINGTON, KY (February 27, 2013) – Keeneland has cataloged 137 juveniles for its 2013 April Two-Year-Olds in Training Sale, to be held Monday, April 8, at 4 p.m. ET. A Preview Show is scheduled for Thursday, April 4, beginning at 10:30 a.m. 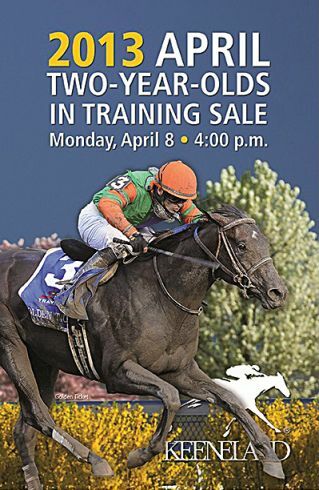 The interactive April Sale catalog will be available online at Keeneland.com the week of Monday, March 4. Print catalogs will be mailed the week of March 18. The April Sale has produced five classic winners during its rich 20-year history – Preakness (G1) winner and champion Lookin At Lucky; Kentucky Derby (G1) and Preakness winner and champion Big Brown; Kentucky Derby and Belmont (G1) winner and champion Thunder Gulch; and Kentucky Oaks (G1) winners Keeper Hill and Gal in a Ruckus. Recent graded stakes-winning April Sale alumni include such notables as Golden Ticket (2012 Travers Stakes-G1); Love and Pride (2012 Personal Ensign Handicap-G1 and Zenyatta Stakes-G1); Balance the Books (2012 With Anticipation Stakes-G2 and Bourbon Stakes-G3), and Group 3 winner What a Name (IRE), joint champion two-year-old in France and rated second at 111 pounds in the two-year-old filly category on the 2012 World Thoroughbred Rankings. Juveniles representing 66 stallions have been consigned to the April Sale, highlighted by such leading sires as A. P. Indy, Arch, Bernardini, Distorted Humor, Empire Maker, Giant’s Causeway, Hard Spun, Harlan’s Holiday, Indian Charlie, Malibu Moon, Medaglia d’Oro, More Than Ready, Pulpit, Smart Strike, Street Sense, Tapit, Tiznow, Unbridled’s Song and War Front, among others. Keeneland will stream the entire April Sale and Preview Show at Keeneland.com.